Can Office 365® Identities be used as Core Identities? Home » Blog » Can Office 365® Identities be used as Core Identities? 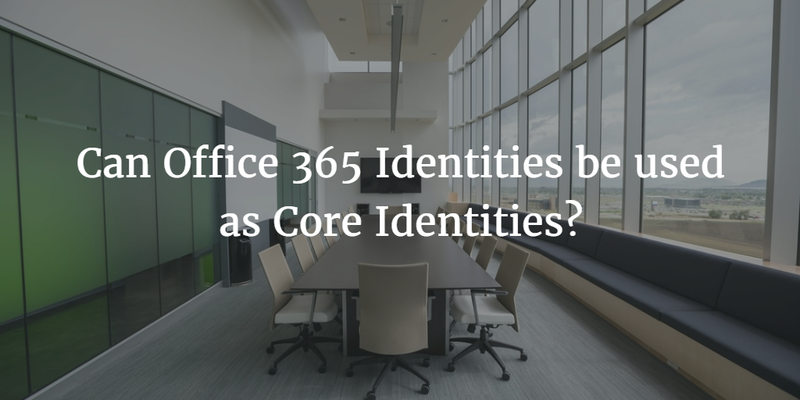 As IT organizations shift to the cloud-based Microsoft Office 365 platform, a common question that we hear is, can those Office 365 identities be leveraged as core identities? The question really stems from the thought process that every employee within the organization will already have credentials through Office 365. So wouldn’t it be ideal if that platform could become the core identity provider? This is especially true for any of the organizations that are using Office 365 but don’t have a core identity provider such as Microsoft Active Directory or OpenLDAP. These startups and cloud-forward companies are often the first to begin to wonder how to use their O365 identities for more than just O365. In order to understand how to leverage O365 credentials throughout an organization, we need to step back and understand the overall identity management approach that Microsoft is taking with O365. O365 identities are not portable outside the Azure platform. However, there are different approaches to creating that portability. Microsoft’s designed architecture is to leverage Microsoft Active Directory on-prem as the core identity source. Organizations would then federate those identities to the cloud-hosted Azure Active Directory platform. Consequently, Azure AD becomes the identity provider for O365. Unfortunately, this approach requires a number of different moving parts. Those same identities are not easily leveraged for Mac or Linux systems, cloud servers at AWS, or WiFi authentication. In short, Microsoft’s identity architecture is excellent… for Microsoft platforms. Thankfully, there are other methods to make O365 identities the core identities throughout an organization. A cloud-based directory service called Directory-as-a-Service centralizes user management throughout an IT infrastructure. Seamless integration with Office 365 makes Directory-as-a-Service an organization’s core unified directory platform. In other words, the identities within the cloud directory service can be leveraged for systems, applications, and networks. Since the cloud identity management system is independent, the major platforms are all considered equal. For example, Mac and Linux systems are tightly managed for users and devices similar and equal to Microsoft Windows. Office 365 is as tightly integrated as Google Apps and AWS. Further, it doesn’t matter to Directory-as-a-Service whether the systems are on-prem or in the cloud. The cloud directory centralizes identities and federates them to whatever IT resources users need. Those identities can be the O365 identities that users already have and leverage. As IT organizations consider leveraging Office 365 identities throughout their IT infrastructure, it’s only natural to think that Microsoft identity management systems could do this. Unfortunately, they aren’t the right choice for this task. 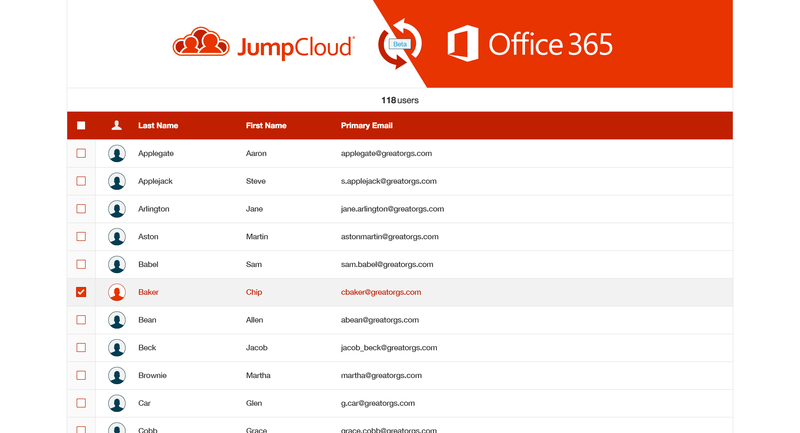 JumpCloud’s Directory-as-a-Service platform is the cloud directory that you can use to federate O365 identities to your systems, applications, and networks. If you would like to learn more about how to have your core identities be those used at O365, drop us a note. We’d be happy to walk through how our SaaS directory service can support you. 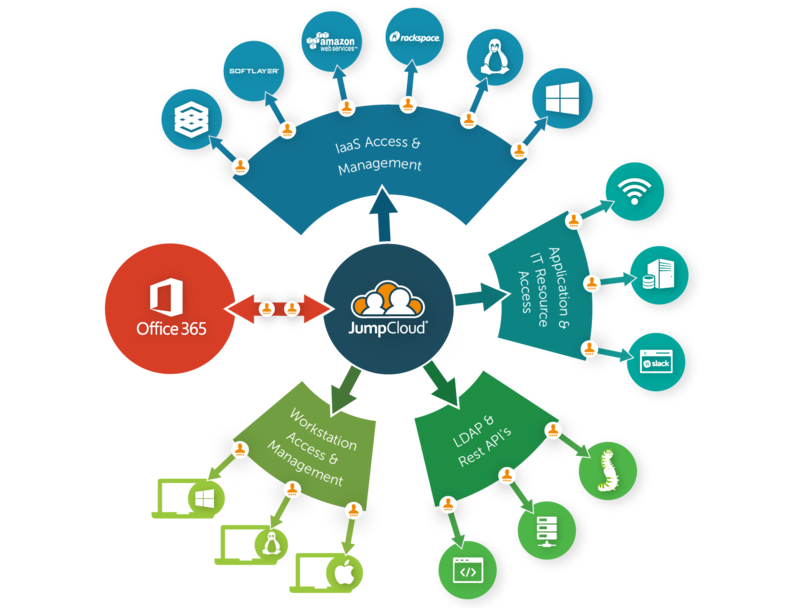 Alternatively, feel free to give JumpCloud’s DaaS platform a try for yourself. Your first 10 users are free forever.